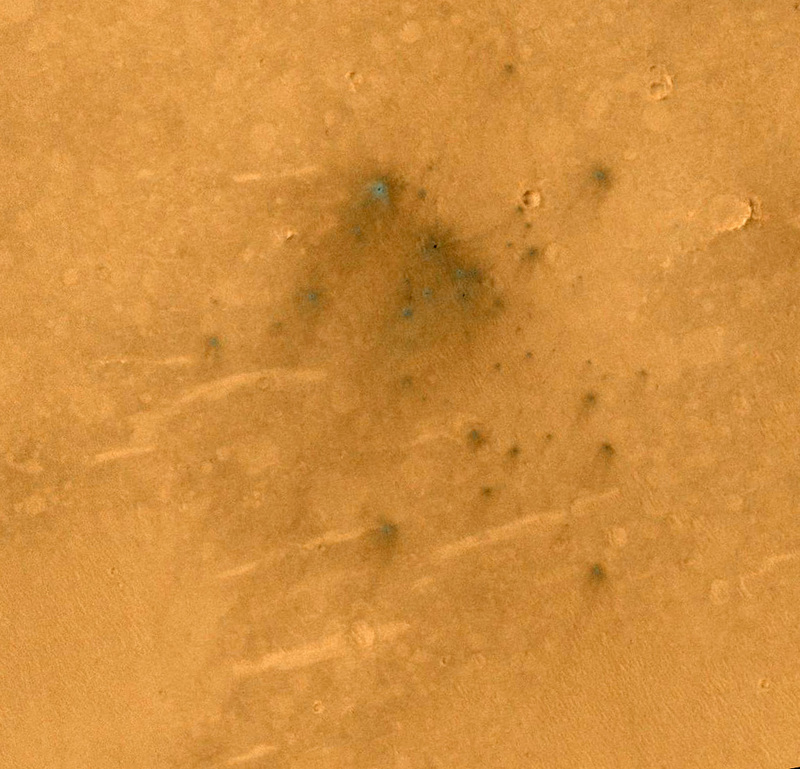 This cluster of small impact craters was spotted by the Context Camera on Mars Reconnaissance Orbiter in the region northwest of Gale Crater, the landing site of the Mars Science Laboratory (MSL) rover, Curiosity. We had suspected that the cluster was produced by the impact of MSL's hardware onto the surface of Mars, because we could see it in CTX images after the landing, but it was not present in images prior to the arrival of MSL. Consistent with this interpretation is the fact that the cluster is located along a line between the Curiosity landing site and a strewn field of debris previously identified in HiRISE images as being caused by MSL hardware, in particular the cruise stage and/or tungsten weights used as cruise balance masses (see the caption for ESP_029245_1755 and associated links). 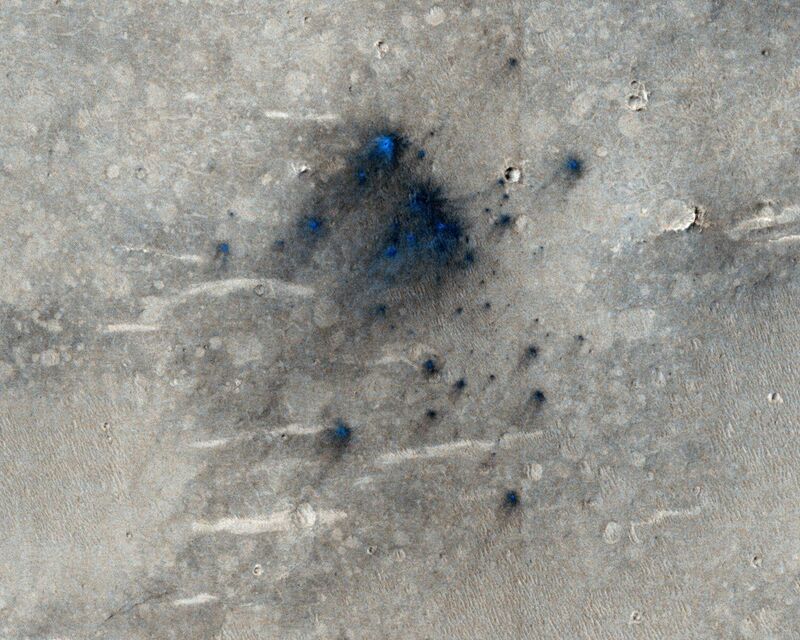 Over a year has passed since the landing, so this impact cluster is not as fresh as those imaged earlier and has been degraded somewhat by winds from the northeast. Nevertheless, the cluster shows some similarities to the impacts up-range, including asymmetric ejecta patterns that indicate an oblique impact (estimated to be only 9 to 10 degrees above horizontal). The cluster is located some 9 kilometers downrange of the impacts imaged earlier, about 70 kilometers away from the rover landing site. 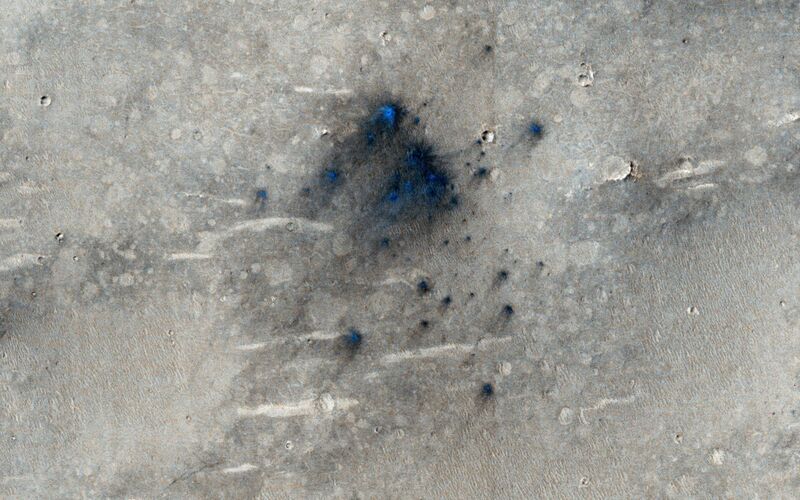 With a closeup image, we see that it is was produced by a "shotgun blast" of at least 40 individual impacts that formed small craters no larger than 2 meters in diameter. In contrast, the up-range impacts included four craters that were 4 to 5 meters in diameter. Assigning each of the impacts to specific pieces of hardware is a challenging puzzle, but it is thought that the four large craters were produced by two large tungsten weights that broke in half to make these four craters, or by pieces of the cruise stage, which was designed to break up in the atmosphere for planetary protection purposes, to kill any Earthly microbes. The cluster imaged here adds to the mystery, and may have been produced by a piece of the cruise stage that travelled farther through the Martian atmosphere and was therefore more thoroughly fragmented by the time it crashed onto the surface.